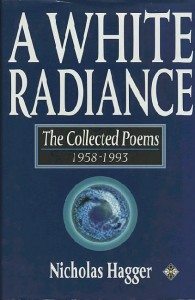 A White Radiance (a title taken from Shelley) contains 1,272 poems written between 1958 and 1993, a span of 35 years. They are arranged chronologically and include all the poems in Selected Poems and referred to in A Mystic Way and catch the movement in the self and the Age. ‘The Silence’ (1965-6) is set in Japan, his prophetic vision of the end of Communism ‘Archangel’ (1966) is set in Russia and China, his poem on decline ‘Old Man in a Circle’ (1966-7) is set in Europe, and his ‘American Liberty Quintet’ is set on the east coast of the USA. His themes are existential and Universalist, and many lyrics hint at the metaphysical Reality behind the universe in accomplished metres and rhyme. There are two Prefaces on the Baroque and on the Metaphysical Revolution, and there is a Commentary. Nicholas Hagger’s poetic output rivals that of many of the great 19th-century poets, such as Wordsworth and Tennyson. Reflecting his journey towards the mystic Light, which has only really been touched on by Yeats and Eliot among the 20th-century poets, Nicholas Hagger’s catches both the movements within the Age and within the self as it understands the universe. Hagger’s poems should be read in conjunction with his Autobiography, A Mystic Way, and volume 1 of his Diaries (1958-1967), Awakening to the Light. The mystical light, the unifying reality behind the universe, this is the summation of Nicholas Hagger’s metaphysical quest and the basis of all his writings. This volume of Nicholas Hagger’s collected poems (his entire output over thirty-five years, in chronological order) confirms him as a major poet, and as a poet whose mysticism puts him on a par with Yeats and Eliot. His unitive vision sheds a penetrating light on world events and political change – and also on our inner selves. His early masterpiece on his personal spiritual transformation, The Silence, is set in Japan; he prophesied the end of Communism in Archangel (1966). His perceptive poem, Old Man in a Circle, covers political and social decline in Europe; and America’s East Coast is the background to his American Liberty Quintet. Poets do not often offer a commentary on their poems, but this collection can be read in conjunction with Nicholas Hagger’s autobiography, A Mystic Way, and the first volume of his diaries, Awakening to the Light, both also published by Element. This is a rare opportunity to understand the background against which these unique and powerful poems were written and the philosophy which underlies them.